An element generated in 3D software ideally contains multiple passes for more control. Even with that, if the lighting direction and perspective of an element are wrong, there’s no practical way to make it match (Figure 10). Figure 10. All of the 2D compositing trickery in the world can’t change the fact that this element is angled wrong. It is also lit from the wrong side. 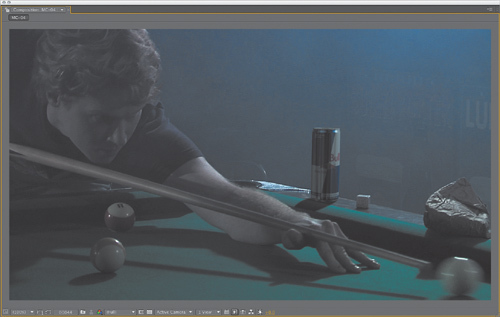 On the other hand, compositing frees artists from hanging around trying to solve everything in 3D software. Figure 11 shows the simplest solution to the previous problem: Match the camera angle and basic lighting by observing what’s in the scene. From looking at the pool balls and shadows, it seems apparent that there are a couple of overhead lights nearby and that the one off camera right is particularly strong. Figure 11. The angle and lighting have been roughly matched in 3D; rather than tweaking it further there, work on getting a quicker and more accurate result in 2D. The angle can be matched by placing the background shot into the background of the 3D software’s camera view, making sure that there are a couple of lights roughly matched to that of the scene to produce the correct shading and specular highlights. This element does not match perfectly, but I am done with what I need to do in 3D. 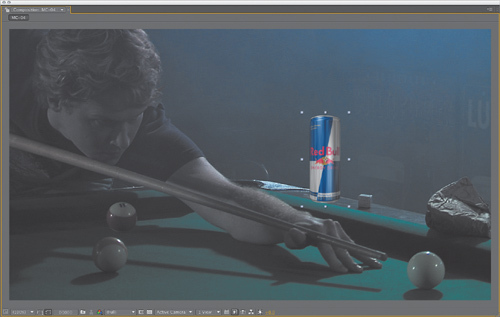 More complex and dynamic perspective, interactive lighting, animation, and other variables certainly can be done in 3D, yet at the end of the day, the clever computer graphics artist moves a scene over to 2D as soon as the elements are within shooting distance (Figure 12). Figure 12. The color-matched final includes a shadow. True story: Return of the Jedi had its debut on national television in the ‘80s, and when the emperor appeared, black rectangular garbage mattes could clearly be seen dancing around his head, inside the cloak. All of this happened prior to the digital age, and these optical composites clearly worked fine on film—they were done at ILM by the best optical compositors in the business—but on video, those blacks were flashed and the illusion broke. Don’t lose your illusion, Axl, use it. Now that you know how to match levels, put them to the test. Slam the gamma exposure of the image: Just adjust the Exposure control at the lower right of the viewer upward. 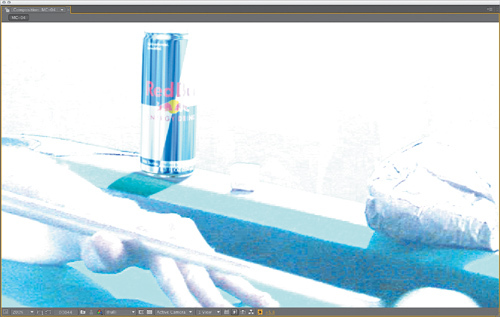 Slamming (Figure 13 on the next page) exposes areas of the image that might have been too dark to distinguish on your monitor; if the blacks still match with the gamma exposure slammed up, you’re in good shape. Everything must match whether the image is blown out or dimmed way down. Figure 13. 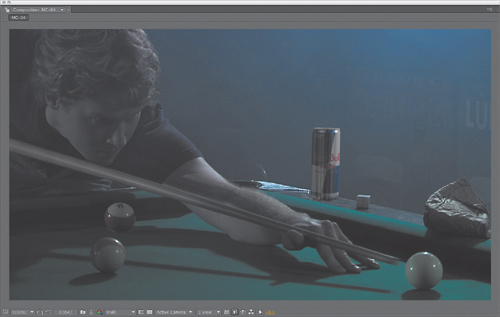 Slamming gamma is like shining a bright light on your scene. In this case it reveals a mismatch in the shadow color and the need for grain.